There are a few key ingredients you’ll need when it comes to producing your own music. One of them is a keyboard so you can create and record your own beats and music into your studio computer. So where do you start? With the best MIDI keyboard under $100. 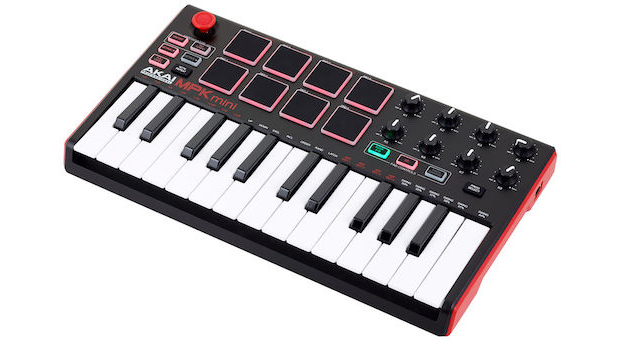 The MPK Mini MkII portable keyboard from Akai Professional has all the functions you’ll need to create your own track, either in your studio or if you’re on the go. But what features does it have and how does it work? Will it really have everything you need to produce a track? 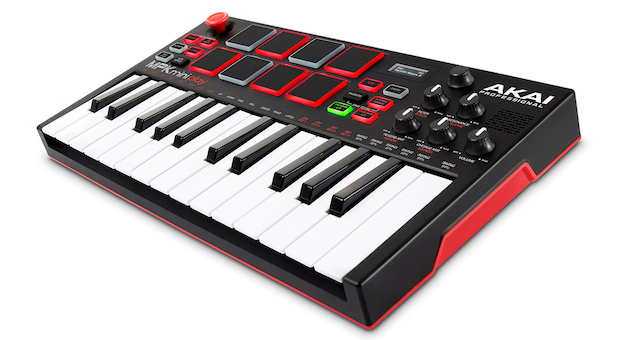 Luckily this article is all about the best budget MIDI keyboard on the market at the moment. We’ll give you a rundown of everything you need to know about this fantastic bit of kit. 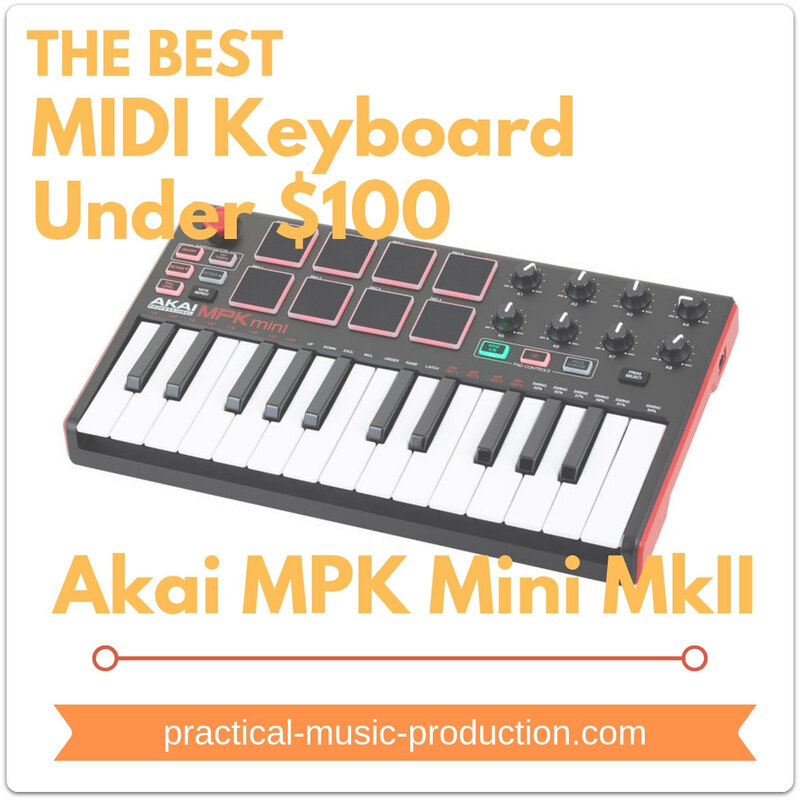 The Akai Professional MPK Mini MkII is a compact MIDI keyboard designed with all the features and production controls you need to make a track wherever you go. The MPK Mini MkII lets you compose, record, and perform music with virtual instruments, DAW (digital audio workstation) effects, and software plug-ins for the travelling desktop producer and musician. It’s a truly innovative and versatile product that allows you to flow with your creativity – it comes with top-quality software to aid you in making your music. What’s also impressive is the slim compact design which makes it the perfect keyboard to travel with – you can easily fit the keyboard into any travel bag. 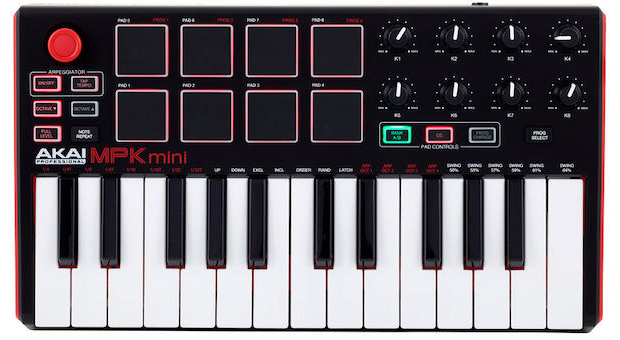 The MPK Mini MkII isn’t just for musicians and producers who travel extensively. It’s also a premium keyboard controller for any small home studio, especially if you’re working with a laptop. The beginner or professional sound engineer, producer, or musician can benefit from this keyboard as it can be used for live shows as well as recording. You can also use this device to learn the basics of music production for those who need a simple and straightforward MIDI device. This makes it perfect for students who might have a tight budget but have a lot of passion and ideas. If you don’t know much about producing music yet then this will also be perfect for you. It’s incredibly easy to get to grips with and understand. If you’re willing to take the time to learn, with the right amount of research and tutorials anyone is able to use it to start creating and producing music. If you’re simply looking for a keyboard to learn how to play the piano or read sheet music, then you will need a proper piano with all the weighted keys and the correct setup (a digital piano would be perfect). The MPK Mini MkII wouldn’t be suitable for this purpose. The MPK Mini MkII comes with a user manual, giving you a brief description of how to use all the controls on the keyboard. It also gives you a link where you can download the software that will integrate it with your studio computer and programs. It comes complete with a USB cable so you can plug it into your PC or laptop (it even works with a smartphone or tablet). It’ll work with the software in partnership with your hardware to get you producing tracks. You can also connect it to an audio interface if you’re using one in your studio (and I’d highly recommend that you do). Unfortunately, the product doesn’t come with any extra accessories like a mounting stand, although this wouldn’t be compact enough for you to travel with. You don’t get a protective cover for your Mini MkII but you can put it in any bag as it’s compact and light enough to carry. If you want to see exactly what you’ll be getting, you can watch the below unboxing video. The user interface of this keyboard may seem a little overwhelming for the beginner, but there’s no need to worry about this. We’ll go through all the controls and functions to make it easier for those who need a quick overview. And like anything, a little practice will lead you to quickly getting the hang of it. In the top left-hand corner of your Mini MkII keyboard, you’ll find a small red joystick. This is your pitch bender which allows you to change the pitch and effect of your notes or instrumental sound by pushing it in different directions as you play. Below your pitch bender, you will find the arpeggiator buttons. One of the functions of the arpeggiator is to change the tempo to suit you. The LED light blinks to the tempo you’ve set it to. Below your arpeggiator, you will find two octave keys. These two keys simply allow you to change the octave of your notes up or down. There are only 25 keys on the keyboard, so this is a very helpful feature. Next to these you’ll find eight pressure-sensitive pads that can produce different sound effects. For each pad, there are adjustable controls allowing you to control each sound and effect individually. These pads are great for creating beats and loops as well. 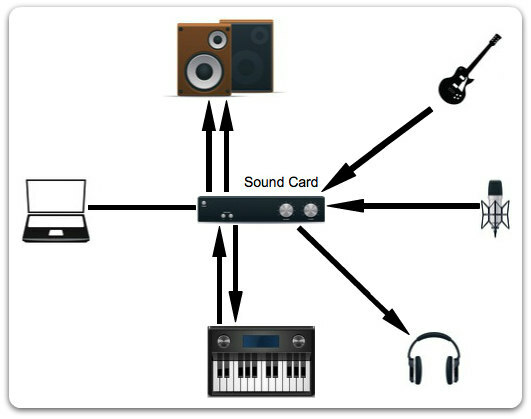 Each pad can produce a sound from a virtual instrument you have loaded on your studio computer. Using the controls you can change the notes and the effects that each instrument produces. With the easy-to-use MPK mini MIDI Editor, you’re able to edit and control your sounds as you go. The editing software allows you to tweak and customize your favorite virtual instruments, DAWs and plug-ins which allow you to create your own unique sound. As this keyboard is fully portable you don’t need any external power to operate your device. The USB cable connects your MPK Mini MkII to your Mac or PC and draws the power it needs from there. With the additional four memory banks, you’re able to load and store your produced tracks for easy retrieval. You can also save your presets for your hardware or software. This simply makes it easier for you to set up and start producing tracks quickly without any additional hassle. Installing the Akai Professional MPK Mini MkII is very easy and user-friendly, and the manual is also very clear. All you have to do is plug in your USB cable and connect it to your computer to get started. There are complete step-by-step instructions on how to download and install your software, completely hassle-free. The MPK MkII might be easy to install, but if you’re not familiar with the fundamentals of music production you may struggle to understand how to use the hardware controls and the software programs. To understand the interface and how to use the controls on your Akai keyboard, check out the walk-through below. A tutorial on how to produce music using your MPK MkII can also help in getting you started. You can set up a mini home studio with this keyboard virtually anywhere, as long as you have a laptop with you. The software allows you to record your music and save your tracks into folders after you’re done producing them. One of the many benefits is you don’t need any microphones or a professional recording studio to use your MPK MkII. The software does all the work for you, minimizing the set-up time and hardware installation, and eliminating the cost of studio time. The MPK MkII may be inexpensive but the software can be a bit technical for those just starting out. For something more user-friendly you can use the Arturia MiniLab Mk II. Like the MPK MkII, the Arturia MiniLab is also portable as it’s light and compact, but the user interface is designed differently which may be better for certain people. The software is also less technical to set up so you can get to grips with starting a track very quickly. The Arturia MiniLab comes with a massive collection of 5,000 different sounds when combined with the included Analog Lab software. Becoming a music creator or producer has never been as easy as it is nowadays. With no costs involved for studio time and none of the hassle of setting up lots of recording equipment, you can use the Akai Professional MPK Mini MkII to produce any track you want, quickly and easily. Travelling isn’t a problem either as you can take your mini laptop studio with you wherever you go, and let your ideas flow every time you’re struck with a moment of inspiration. This keyboard from Akai is by far the best MIDI keyboard under $100 you can get. Why not pick one up and see where your creativity takes you?